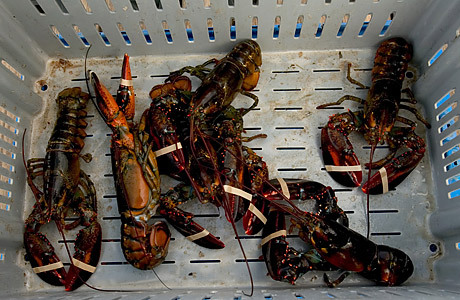 Maine's lobster industry generated close to $300 million in 2006, according to its trade group. But the University of Maine's Lobster Institute still deserves taxpayer funding, according to the state's lawmakers. Maine's two Republican Senators and Rep. Thomas Allen, a Democrat, lined up $188,000 from the National Oceanic and Atmospheric Administration to launch the Lobster Health Coalition at the institute, whose other accomplishments include developing a live Internet "Lobster Cam" and devising lobster treats for dogs, called "Bisque-its." Critics haven't hesitated to broil the government's support for the organization: "This is what the American taxpayer is paying for  the 'Lobster Institute for Better Dog Food,'" railed David Williams of Citizens Against Government Waste, a budget watchdog group. "This is ridiculous." But defenders say lobster health matters is vitally important to the area's economy. "Lobsters get sick just like any other animal," institute director Robert Bayer told a local newspaper. "We want to know what those health issues are and how we can mitigate them." Sen. Olympia Snowe said the lobster industry is vital to her home state of Maine, but also pointed out she "did not in fact make this specific request."